Fountains was the second of the Yorkshire houses to be founded. In spite of its rather inauspicious beginnings, Fountains became the largest and richest of the Northern abbeys and headed an extensive family that extended to the shores of Norway. Fountains stemmed from the Benedictine house of St Mary’s, York, where a group of reform-minded monks fled from their abbey to pursue a harsher and more disciplined way of monastic life. They were at first sheltered by Archbishop Thurstan, who assumed the role of patron and adviser. Thurstan later settled the community on land at Skeldale, near his archiepiscopal manor at Ripon. The monks were not at this time part of the Cistercian community, but were soon welcomed within the family of White Monks. Finally he set them in a place of pasture. The place is called Fountains, where continuously from that time onwards so many have drunk, as it were, from the Saviour’s fountains the waters that leap up to eternal life. The community suffered severe hardships in its early years and was on the point of disbanding. However, the arrival of several wealthy recruits brought a change in fortunes and secured the abbey's future. Recruitment and endowment flourished thereafter and by the late twelfth century Fountains had lands in over two hundred places. Throughout the Middle Ages Fountains played a prominent role in Cistercian, ecclesiastical and political affairs. Indeed, Abbot Henry Murdac (1144-7) spearheaded opposition to William Fitzherbert's appointment to the see of York. Fountains also made an important contribution to poor relief during the famine of 1194-6 that afflicted Western Europe. The community helped a number of needy souls who flocked to the abbey gates, extending spiritual and bodily care. Fountains experienced financial problems in the 1290s and, like all of the northern houses, fell victim to the Scots in the early fourteenth century. 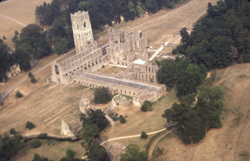 The abbey recovered its fortunes in the fifteenth century and by the time of the Dissolution Fountains was the richest Cistercian abbey in Britain and the twenty-fourth wealthiest house in the country. Today, the ruins at Fountains include some of the most significant Cistercian remains in Europe, notably, the twelfth-century western range and the oldest surviving Cistercian water-mill. Excavations at Fountains have uncovered the remains of the first timber buildings, which were begun in 1134. On the pages that follow you can read about the abbeys history, lands and buildings. You will soon be able to view a panoramic tour of the site, to see a Quicktime movie of the newly-restored muniment room, and tour the models that we have built of the church and the monastic precinct.